The Spring Intersession is a great way to catch up or get ahead on your classes. The 2019 session runs from May 22 through June 29, and registration begins November 26, 2018. Attention Pell Grant eligible students, you MUST register for Spring Intersession courses by February 17, 2019 to receive Pell Grant funding for these courses. You will not be able to apply for Pell Grant funding for Spring Intersession courses after February 17, 2019. Financial aid may be available, and the College of Extended and International Education will work with you to create a payment plan customized to your financial situation. For more information, go to the frequently asked questions, or go straight to the course schedule. Check back frequently, as course offerings will change. 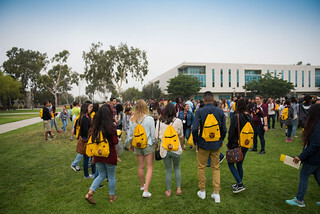 You can also contact the College of Extended and International Education at 310-243-3741 or eeinfo@csudh.edu. Students may withdraw with a "W"